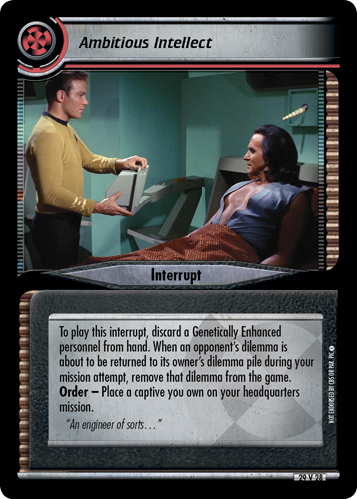 Choose one: download a Genetically Enhanced personnel, or take a Genetically Enhanced personnel from your discard pile and place him or her on the bottom of his or her owner's deck. 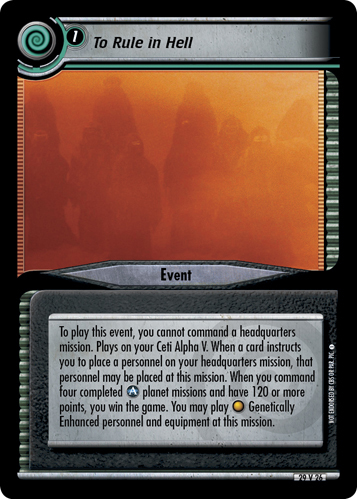 Then, if you command Khan Noonien Singh, you may shuffle this event into your deck. Otherwise, destroy this event. "The battle beings again. ...it's not a world we win, it's a universe." Image Source: The Original Series: "Space Seed"